My fiancé and I made yet another trip to the local apple orchard. This makes 3 trips in the last month and a half! Unfortunately, I think that was the last time for the season because the trees were getting pretty bare and it was getting hard to find good apples this time. Although, we still managed to pick 13 pounds worth somehow! So, I’m trying to squeeze in one or two more apple recipes before November when I feel like apple recipes are out of season and I need to move to pumpkin ones! 1. Whisk together flour, baking powder, and salt and set aside. In another bowl, whisk together the yogurt, milk and egg, until well combined. Whisk flour mixture in with the yogurt mixture and set aside. 3. Heat the canola oil over medium-low heat. You will know it is ready when small bubbles start to form. Dip each apple slice in the yogurt batter and use a spoon to make sure it is completely covered in a thin layer, then place them in the skillet in batches, flipping once when golden brown on the bottom. When both sides have been fried, remove with a fork or tongs and set on a plate lined with paper towels. 4. 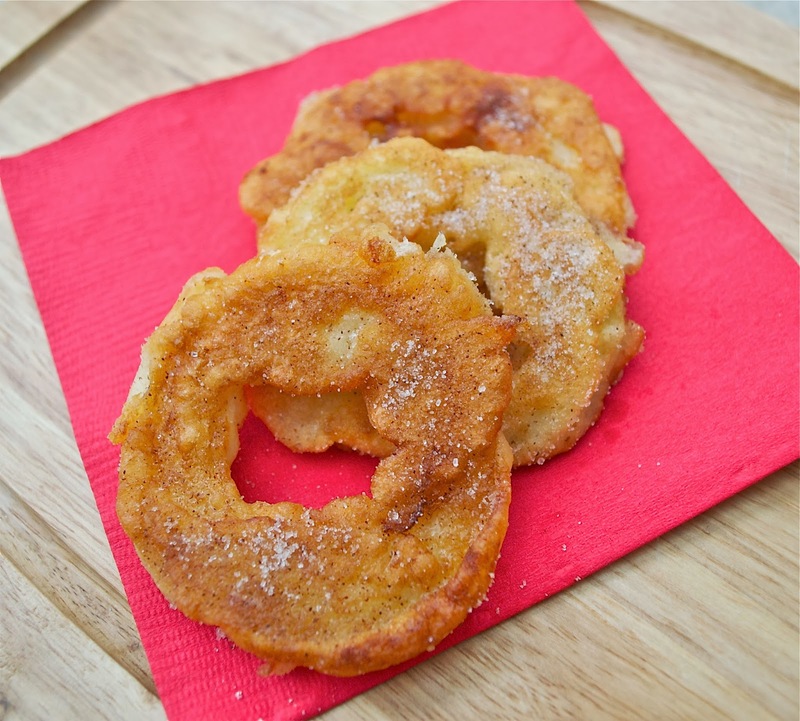 Mix together sugar and cinnamon in a small bowl and sprinkle over the apple rings while they are still hot. Serve while they are still warm.